Relish and bask in the moment, oh most confidently beautiful Pia. You truly deserve all of it. Never do we have a homecoming this grand, except maybe when Manny Pacquiao brings home another belt or, perhaps, Gilas Pilipinas had a respectable finish in an international tournament. But this one's quite different, as the Philippines recently welcomed the return of newly crowned Miss Universe Pia Wurtzbach, who not only brought honor to all of us but also ended a 42-year title drought for the country. From even before the parade started on Monday, January 25, all the way to her final stop, Pia looked every bit like the universe's rightful queen. She was worth falling head over heels for in a stunning royal blue-green gown, complete with her majestic diamond and sapphire crown. Even the skies cooperated and let her have her way. She first paid a courtesy call to Manila Mayor Joseph Estrada, who honored her with a key to the city. Pia then headed to the Senate to meet some of the lucky statesmen, particularly Sen. Sonny Angara, who has a bit of pageant history with the homecoming queen. As for us average Joes, we had to make abangers along the parade route stretching to Manila and Makati, and resort to the most extreme of measures just to catch a glimpse of her. Some people were fortunate enough to come close to Pia, like actress Maine Mendoza, whom the former was able to spot amidst the rambunctious crowd and even shot back with the latter's famed pabebe wave. 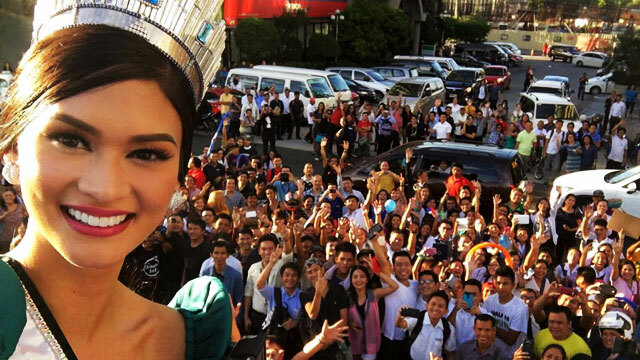 Approaching her parade's last stop, Araneta Center, where all of this began (read: her win at last year's Binibining Pilipinas pageant held at the Smart-Araneta Coliseum), no one could blame Pia for breaking down, albeit still beautifully. Having joined Binibining Pilipinas thrice, and eventually winning it and getting the chance to represent her country last year, it must've been a grueling yet still graceful journey for the 26-year-old Filipina-German. Now, relish and bask in the moment, oh most confidently beautiful Pia. You truly deserve all of it.